IEE Illegal English Edition : the English-only version of You&apos;re gonna rire. Sugar Sammy presents a comedy show that truly capturing the essence of what it is to be a Montrealer. The "Bill 101 Comedian" dives in the 1995 referendum, "Carré Rouges", "Les accomodements raisonnables" and the re-election of the separatist party, le "Parti Québécois". Everything and everyone is a potential target! Sugar Sammy lives and embrace globalization. He dreams of a Québec that accepts and opens more to all cultures. Winner of the Comedian of the year at Gala Les Olivier 2013, Sugar Sammy is the biggest Québec comedian on the English comedy scene right now. He presented over 1000 shows in 30 countries and has visited some of the largest cities in the world. Still, MONTRÉAL remains his first love, his hometown. The content of this show is specifically addressed to Montreal residents&apos; and is not presented elsewhere in the world. 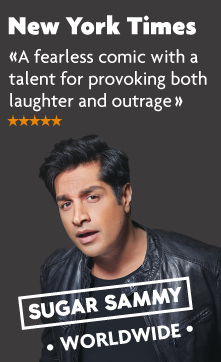 On top of local content, Sugar Sammy unveils to his biggest fans, in his favourite city, in his favourite province, in his favourite country, new material tested internationally. The show is presented in a traditional stand up comedy club format. The approach is raw: just a microphone and a flurry of jokes and laughter for 90 minutes.